I love seeing the transformation a cover goes through. 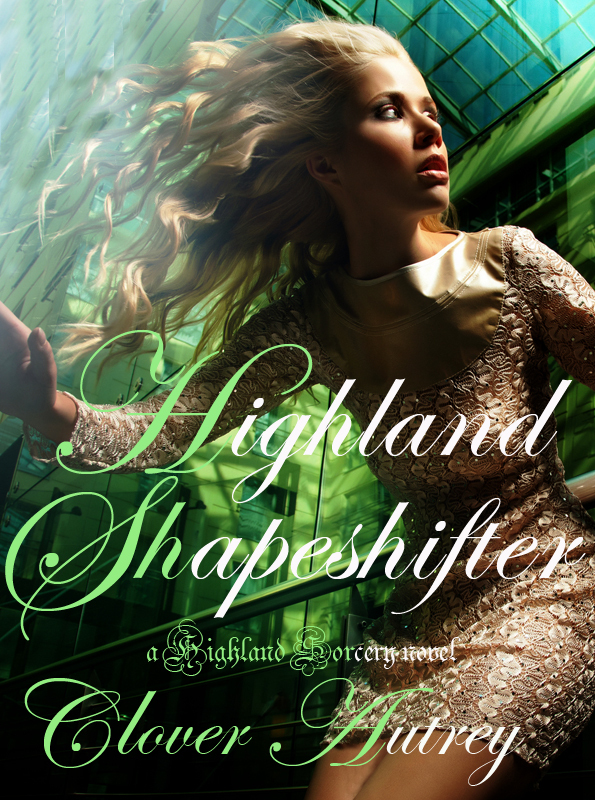 And I'm so pleased with how this latest one turned out for Highland Shapeshifter. Here's the original stock photo: What caught my eye was not only the movement of the shot, but the worried expression on the model's face. So far I've loved all the girls on the Highland covers for their melancholy looks. On each of them, I'm drawn in, wondering what they could be thinking about. Then it got tweaked a bit. Even though it will be cropped for the ebook cover, a version this size will be untouched for when we start working on the paperback size. It will be a little tricky since she is smack in the middle so the back cover area will have to be expanded, but that's for later. This one below has been tweaked a bit, removing her reflection behind her. Later on the weird shadow on her leg will be removed and the brightness in the top left corner will be toned way down. Next, it gets cropped. That was a little harder to decide which way to go because there is so much movement. The general photography rule (as my Sweetheart photographer husband is apt to point out) is for the subject's face to always look inward on the largest "rule of thirds" space. However, I liked the movement of her hair and hand lifting outward. It just felt more active, like she was on the run (which she is throughout most of the book) so I broke the rule and had it cropped so her face is closer to the edge, like she's looking off the page. Below, notice the shadow from her dress on her leg is gone. She also has some weird nipplish going on with how she's leaning down, and since I write on the Sweeter side, I don't really want that, but some strategic letter placement with the title should take care of that. The things you have to look out for, right? Here's the final copy. The light at the top corner is toned down a bit to give more focus on the letters. I really wanted a green on green, but the background was so busy, it was just hard to read and not showing up, so I went with kind of a white and green combination, which fits with the title lettering of the first book in the series with lighter and darker shades so it keeps a good continuity between books. I love how it turned out and can't wait for this book to come out this month. So what do you think of it? Thanks Lara. I'm in heaven with it.